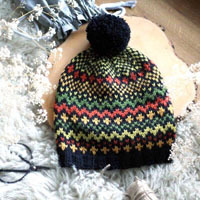 Go to original pattern for design DROPS 195-14. 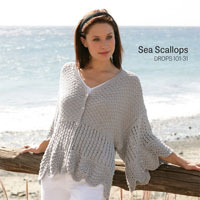 Crocheted jumper in DROPS Sky. The piece is worked top down with lace pattern and long split in the sides. Sizes S - XXXL. 16 treble crochets in width and 8 rows in height = 10 x 10 cm. DROPS CROCHET HOOK SIZE 4.5 MM. The hook number is just a guide. If you get too many stitches on 10 cm, change to a larger hook size. 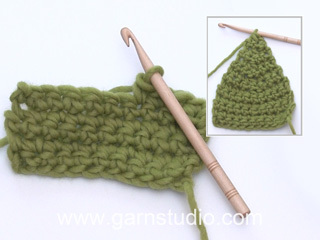 If you get too few stitches on 10 cm, change to a smaller hook size. 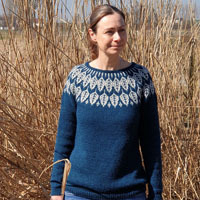 You can get the yarn to make this pattern from	24.50£. Read more. At the beginning of each row of treble crochets, the first treble crochet is replaced by 3 chain stitches. 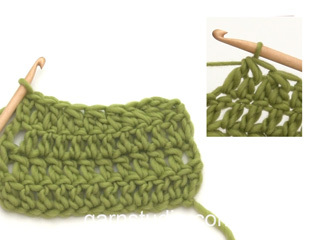 The row finishes with 1 treble crochet in the 3rd or 2nd chain stitch from the beginning of the previous row (depending on whether the previous row started with 3 or 2 chain stitches). At the beginning of each row of double crochets, the first double crochet is replaced by 2 chain stitches. 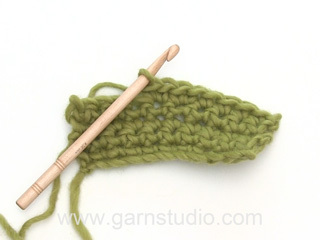 The row finishes with 1 double crochet in the 3rd or 2nd chain stitch from the beginning of the previous round. 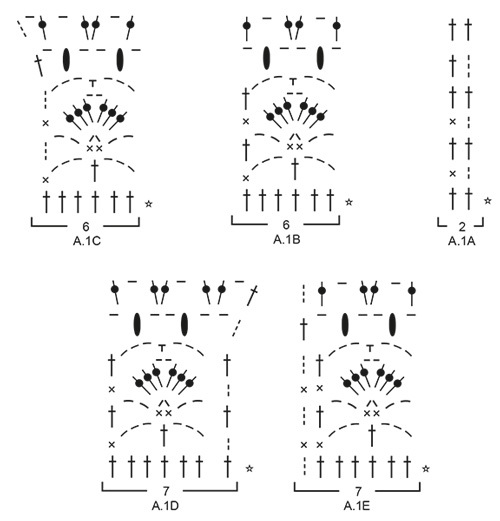 See diagrams A.1 to A.3. Decrease 1 stitch inside of the 2 outermost stitches in each side. Decrease 1 stitch by skipping 1 stitch. It is difficult to say where the decreases will occur in the pattern, but adjust so that you decrease on a row of treble/double crochets (not on a row of large chain-spaces). 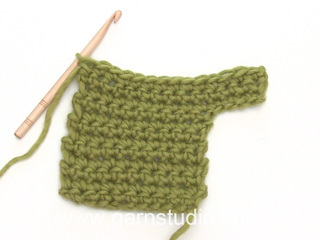 Increase 1 stitch by working 2 double crochets in same stitch. Front and back pieces are worked back and forth separately, top down. You first work the right front shoulder increasing for the neck, then the left shoulder increasing for the neck before the pieces are worked together back and forth to finished length. The back piece is worked in the same way. The sleeves are worked back and forth, top down. The garment is sewn together before working a finishing edge to the neck. Work 28-28-36-44-44-52 chain stitches with hook size 4.5 mm and Sky. The first row is worked as follows from the wrong side: Work 1 treble crochet in the 4th chain stitch from the hook, * skip 1 chain stitch, work 1 treble crochet in each of the next 3 chain stitches *, work from *-* to end of row = 20-20-26-32-32-38 treble crochets on the row. The next row is worked as follows from the right side: Work A.1A (= 2 stitches), work A.1B over the next 12-12-18-24-24-30 stitches (= 2-2-3-4-4-5 repeats of 6 stitches) and finish with A.1C (= 6 stitches). Continue this pattern back and forth until A.1 has been completed. REMEMBER THE CROCHET TENSION! Lay the piece to one side and work the left front shoulder as described below. The next row is worked as follows from the right side: Work A.1D (= 7 stitches), work A.1B over the next 6-6-12-18-18-24 stitches (= 1-1-2-3-3-4 repeats of 6 stitches) and finish with A.1E (= 7 stitches). Continue this pattern back and forth until A.1 has been completed. At the end of the last row, work 25-31-25-25-31-31 slightly loose chain stitches for the neck. Fasten the loose chains with 1 slip stitch in the outermost stitch towards the neck on right shoulder on the front (from wrong side). Cut and fasten the strand. Now work the pieces together for the front piece as described below. Start from the right side of the right front shoulder; continue working over the chain stitches for the neck and then work over the stitches on the left front shoulder as follows: Work A.2A (= 2 stitches), work A.2B over the next 60-66-72-84-90-102 stitches (= 10-11-12-14-15-17 repeats of 6 stitches) and finish with A.2C (= 7 stitches). NOTE: When working over the chain stitches for the neckline, work 1 treble crochet in each chain stitch. Continue this pattern back and forth. When A.2 has been worked one time in height, work A.3 one time in height in the same way. Then work A.2 to finished length, NOTE: When A.2 is repeated after itself, the 1st row on the 2nd repeat will be worked from wrong side. The 1st treble crochet on row is replaced with 3 chain stitches as usual. AT THE SAME TIME when the piece measures 18-18-20-20-22-23 cm from the cast-on edge, insert 1 marker in each side to mark the armholes. Continue working as described above until the piece measures approx. 65-67-69-71-73-75 cm. 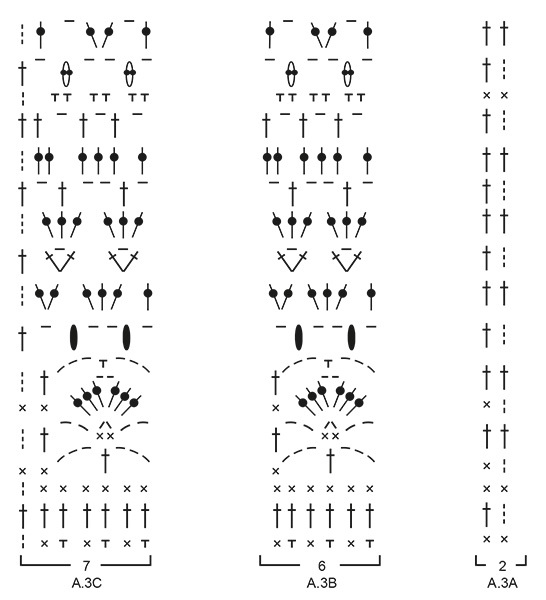 Finish with 1 row of treble crochets – NOTE: Choose a row from one of the diagrams which fits with where you are in the repeat so that you have 69-75-81-93-99-111 treble crochets on the row. Cut and fasten the strands. The front piece measures approx. 66-68-70-72-74-76 cm from the shoulder down. Work 28-28-36-44-44-52 chain stitches with hook size 4.5 mm and Sky. The first row is worked as follows from the wrong side: Work 1 treble crochet in the 4th chain stitch from the hook, * skip 1 chain stitch, work 1 treble crochet in each of the next 3 chain stitches *, work from *-* to end of row = 20-20-26-32-32-38 treble crochets on the row. Lay the piece to one side and work the right back shoulder as described below. Work 28-28-36-44-44-52 chain stitches with hook size 4.5 mm and Sky. The first row is worked as follows from the wrong side: Work 1 treble crochet in the 4th chain stitch from the hook, * skip 1 chain stitch, work 1 treble crochet in each of the next 3 chain stitches *, work from *-* to end of row = 20-20-26-32-32-38 treble crochets on row. At the end of this row, work 29-35-29-29-35-35 slightly loose chain stitches for the neck. Fasten the loose chains with 1 slip stitch in the outermost stitch towards the neck on left shoulder on the back (from wrong side). Cut and fasten the strand.Now work the pieces together for the back piece as described below. Start from the right side of the right back shoulder; continue working over the chain stitches for the neck and then over the stitches on the left back shoulder as follows: Work A.1A (= 2 stitches), work A.1B over the next 60-66-72-84-90-102 stitches (= 10-11-12-14-15-17 repeats of 6 stitches) and finish with A.1E (= 7 stitches). Continue this pattern back and forth. When A.1 has been completed, work A.2 in the same way. When A.2 has been worked one time in height, work A.3 one time in height in the same way. Then work A.2 to finished length in the same way as the front piece. Continue working as described above until the piece measures approx. 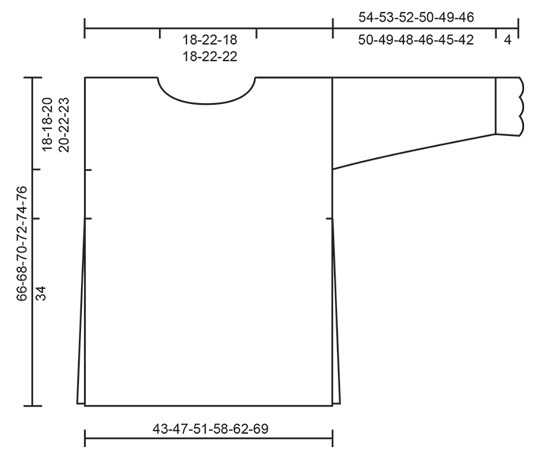 65-67-69-71-73-75 cm – adjust to match the front piece. Finish with 1 row of treble crochets in the same way as the front piece. Cut and fasten the strands. The back piece measures approx. 66-68-70-72-74-76 cm from the shoulder down. Work 77-77-85-85-93-101 chain stitches with hook size 4.5 mm and Sky. 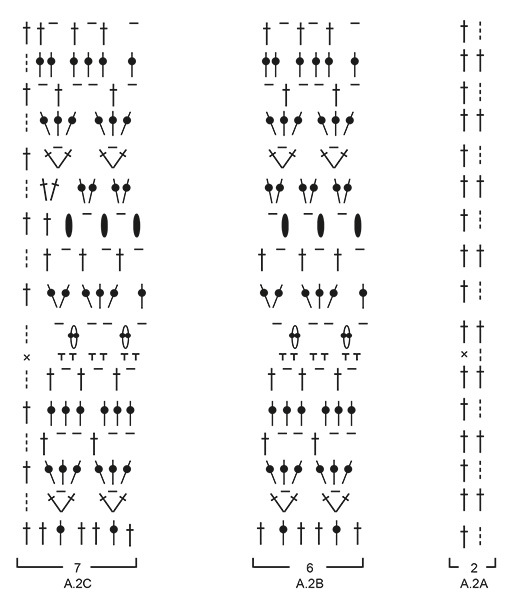 The first row is worked as follows from the right side: Work 1 treble crochet in the 4th chain stitch from the hook, work 1 treble crochet in the next chain stitch, * skip 1 chain stitch, work 1 treble crochet in each of the next 3 chain stitches *, work from *-* to end of row = 57-57-63-63-69-75 treble crochets on the row. The next row is worked as follows from the wrong side: 4 chain stitches (equivalent to 1 treble crochet + 1 chain stitch), skip 2 treble crochets, * 2 treble crochets in the space before the next 3 treble crochets, 1 chain stitch * work from *-* until there are 3 treble crochets left on the row, skip 2 treble crochets and finish with 1 treble crochet in the last treble crochet = 57-57-63-63-69-75 stitches on the row. The next row is worked as follows from the right side: Work A.2A (= 2 stitches), work A.2B over the next 48-48-54-54-60-66 stitches (= 8-8-9-9-10-11 repeats of 6 stitches) and finish with A.2C (= 7 stitches). Continue this pattern back and forth. A.2 is repeated in height. AT THE SAME TIME when the piece measures 2 cm in all sizes, decrease 1 stitch in each side – read DECREASE TIP (= 2 stitches decreased). Decrease like this approx. every 5½-5½-4½-4-3½-2½ cm a total of 9-9-11-11-13-15 times in each side = 39-39-41-41-43-45 stitches on the row. When the sleeve measures approx. 50-49-48-46-45-42 cm (shorter measurements in larger sizes due to wider shoulders) work 1 row of double crochets from the wrong side where you increase 6-6-4-4-8-6 stitches evenly on the row - read INCREASE TIP = 45-45-45-45-51-51 double crochets. The next row is worked as follows from the right side: Work A.1A (= 2 stitches), work A.1B over the next 36-36-36-36-42-42 stitches (= 6-6-6-6-7-7 repeats of 6 stitches) and finish with A.1E (= 7 stitches). Continue this pattern, but finish after the 3rd row of A.1. Cut and fasten the strands. The sleeve measures approx. 54-53-52-50-49-46 cm from the top down. Work the other sleeve in the same way. Sew the shoulder seams. Sew in the sleeves between the markers on the front and back pieces. Sew the sleeve and side seams in one go – start at the bottom of the sleeve and sew edge to edge in the outermost stitch, but finish the seam when there is still 34 cm left, leaving a split in each side. Start on the one shoulder and work the first round as follows with hook size 4.5 mm: Work 1 double crochet in the first stitch, * 3 chain stitches, 1 double crochet around the next row/chain-space *, work from *-* around the whole neck, finish with 3 chain stitches and 1 slip stitch in the first double crochet at the beginning of the round. Work slip stitches to the middle of the first chain-space, work 3 chain stitches, * 1 double crochet around the next chain-space, 2 chain stitches *, work from *-* to end of round, finish with 1 slip stitch in the first chain stitch at the beginning of the round. Cut and fasten the strand. Correction - FRONT PIECE: Then work A.2 to finished length, NOTE: When A.2 is repeated after itself, the 1st row on the 2nd repeat will be worked from wrong side. The 1st treble crochet on row is replaced with 3 chain stitches as usual. Hej. Jag tycker att den är liten i storlek. Brukar sticka/virka storlek S och det brukar stämma. Här fick jag gå upp till storlek L för att få plats med bysten. Upptäckte dock inte detta förrän jag monterat tröjan. Får nu börja om från början. Hallo!\r\nLeider komme ich mit den Ärmeln nicht klar. Wenn ich die Abnahmen mache, stimmt die Anzahl der Maschen nicht mehr, um mit dem Muster weiterzuhäkeln. Mache ich etwas falsch? Liebe Vanessa, die Maschen, die nicht mehr im Muster gehäkelt werden können, können Sie dann mit feste Maschen/Stäbchen häkeln, solange daß die Maschenanzahl richtig ist. viel Spaß beim häkeln! De eerste toer van de rechter schouder (gezien zoals het kledingstuk gedragen wordt) wordt aan de verkeerde kant gehaakt, dus richting de arm, de tweede toer van der rechter schouder wordt aan de goede kant gehaakt, dus dan haak je weer richting de hals. De eerste toer van de rechter schouder (gezien zoals het kledingstuk gedragen wordt) wordt aan de verkeerde kant gehaakt, dus richting de arm, de tweede toer van der rechter schouder wordt aan de goede kant gehaak, dus dan haak je weer richting de hals. Weet niet hoe ik op het voorpand na A2 weer met A3 moet beginnen. Krijg ook de stokjes aan de verkeerde kant ipv aan de goede kant net als de vorige toeren. Je kan gewoon door gaan met heen en weer haken. De laatste toer van A.2 is op de goede kant, waardoor je de eerste toer van A.3. weer op de verkeerde kant haakt. 2 schouders gehaakt op 26 stokjes plus 25 losse voor de hals is samen toch 77 ( maat L) voor het voorpand moet ik in totaal 2+72+7= 81 steken hebben dan kom ik er 4 tekort. Wat doe ik fout? In A.1c en A.1D zie je dat er op de laatste toer 2 steken meer zijn, hierdoor heb je in totaal 81 steken ipv 77 (4 steken extra in totaal) en heb je een lichte ronding in de halslijn. Skal man følge "hækleinfo" når man hækler mønsteret også? Eller er det det, der illustreret med de små lodrette streger i mønstret? Hej Maria, Hækleinfo gælder kun første og sidste maske på hver række. Ud over den information skal du følge diagrammerne. God fornøjelse!